Two little round bluebirds, a male and a female sit huddled on a branch. 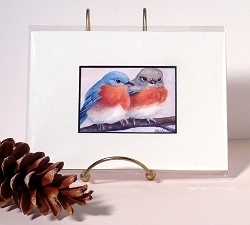 Bluebirds look much rounder in the cold weather because they fluff out their feathers to keep warm. 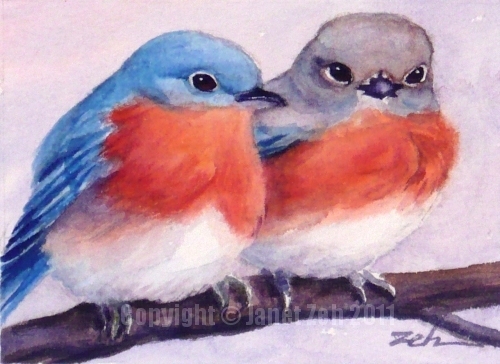 One of my friends has a heated birdbath which attracted a pair of bluebirds and that inspired this painting. The original painting has been sold. You can visit my Etsy shop to see more of my original bird paintings currently available for sale. Thanks for stopping by. today. I am happy to take orders! If you see something you like and would like to order an original painting or a print, please contact me. A beautiful painting Janet, I could spend all night looking through this blog, so much information, I've added you to my blog list for easy access as I'll definitely be visiting again and again! Sharon, thank you for your nice comments. I'm glad you are enjoying my blog!